We interrupt your regularly scheduled superhero fiasco, trailer breakdowns and movie reviews to bring you this Star Wars Day special post. Now, live from the hottest spot in the Philippines, here're your hosts, Pio Martinez, and his father, Ramon Martinez! Not so long ago in America, which is not really far, far away, a creative mind in the form of up-and-coming directional superstar George Lucas enjoyed then mainstream success with American Graffiti. During that period of time, he was inspired by the hit Japanese movie, The Hidden Fortress, which was directed by the legendary Akira Kurosawa, to write a story about a farm boy who was dragged into an epic quest that extends far beyond the stars. Many decades later, the film ended up being a critical hit, and has spawned multiple spin-offs, video games, two animated shows, and at least seven movies for now, all under the collective name of what we all know today as Star Wars. Today is May 4, which was named as the Star Wars Day because Internet users wanted to find a date that matched the famed catchphrase to give a very "punny" name. (We're so sorry for that pun.) And we join with the rest of the other padowans out there to celebrate the rise during the original trilogy, the downfall during the prequel trilogy, and now the rebirth in the sequel trilogy. This post will be separated into three parts, memes, fan-art, and finally fan-made videos, and each will feature four of each. Why four? Because it's May 4 for a reason. And to begin, here're 4 funny pictures. For our first image, let's have Deadpool. Remember Deadpool, right? Yeah, that Deadpool. He had a movie this year, which garnered critical and commercial success, and he also tried to kill us in our meta-posts. 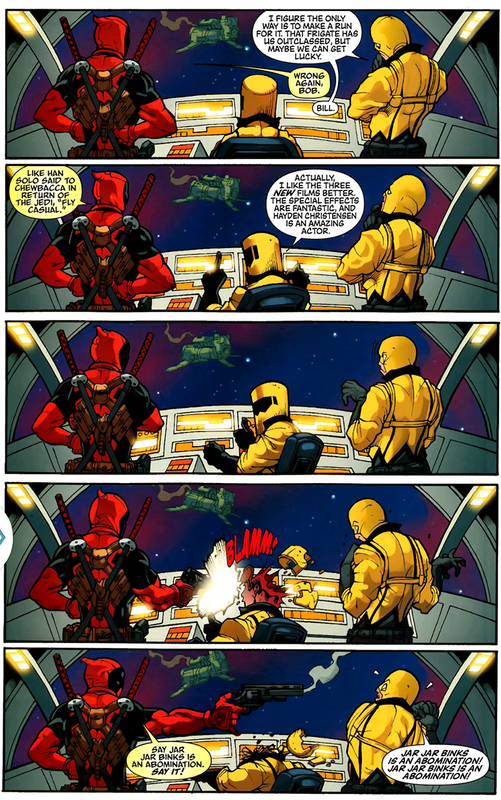 But let's put our differences behind us, and let's laugh it all off with this particular scene from one of Deadpool's comicbook adventures. Who would've thought Deadpool would be such a huge fan of the beloved franchise? And make that a "true" fan, because here, he just killed an Advanced Idea Mechanic, simply because he liked the prequel trilogy better. 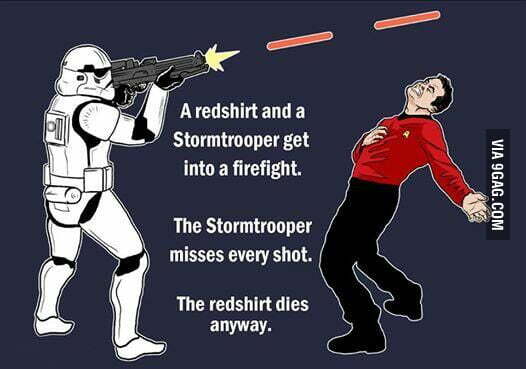 For as long as everyone can remember, Star Wars and Star Trek have had some sort of rivalry, especially since that both focus on intergalactic journeys. 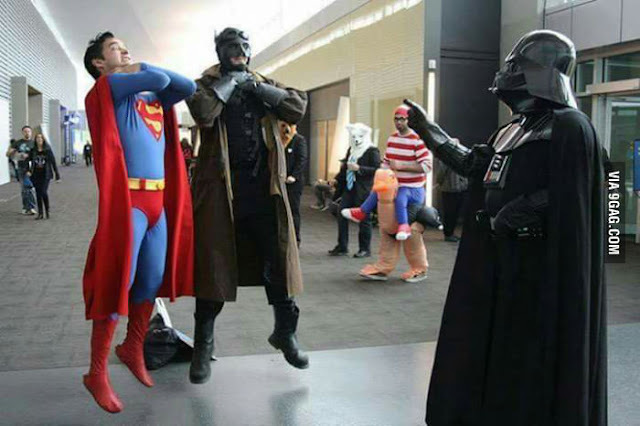 However there is a certain kind of stereotyping that makes each universe unique in their own respective rights. Those poor Stormtroopers truly can't catch a break, because of their clearly terrible accuracy, especially when it comes to enemies just merely a few feet in front of them. They might be feeling a little sad because of their notability, but they sure do keep us laughing with their mishaps. Black, blue and even more black. God and man versus a Skywalker. Day and night versus the stars. The greatest gladiator match in the history of the world, just got a new contender. Son of Krypton and Bat of Gotham, versus Father of The Year. The Dark Capes are coming. The Dark Capes are coming. Batman and Superman v. Vader: Dawn of The Dark Side. It appears that no matter how powerful and mighty Superman may look, or how rich and intelligently-made Batman's arsenal may seem, none of them would have enough strength to defeat a Skywalker. 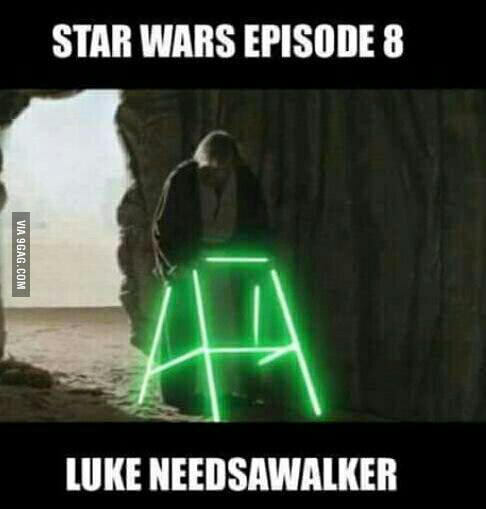 No one can escape age, and that also goes to Luke Skywalker who, as you can see, could really use a walker to combat the Dark Side. But my concern is not on how much of the Force does he need to move around, but rather on how could he hold a lightsaber walker? Wouldn't that disintegrate your hands in a blink of an eye? Besides, didn't get his hand cut-off by a lightsaber? They say that beauty is in the eye of the beholder, and there is no other kind of beauty than that of a fan-art. 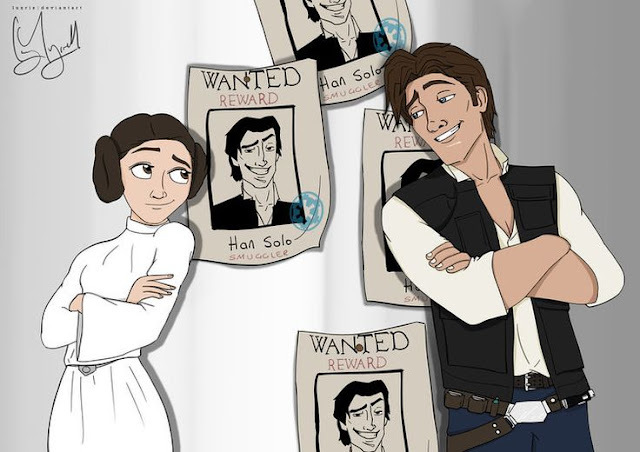 From a fan-art, new perspectives never before done in film or any medium that is part of the Star Wars franchise would be discovered, and enthusiasm to Star Wars would continue to grow. Besides, it's called fan-art for a reason. Below are our 4 picks for the fan-art section. Perhaps what we'd call one of the finest masterpieces / parodies ever crafted, this Last Supper-inspired artwork is not a digital drawing nor a painting. Rather, it is a complexly-produced photograph. We're not kidding, the Stormtroopers, Emperor Palpatine and Darth Vader, they're all regular humans cosplaying in this one image. Yes, the background is a printed image originally drawn from hand. Yep, all the costs for the costumes and the make-up goes to this rather expensive single-take. But personally we've got to admit, it's an awesome tribute! Who doesn't like samurais? Stories about samurais fighting for honor or vengeance are always interesting, especially if this particular movie was inspired by a samurai movie. 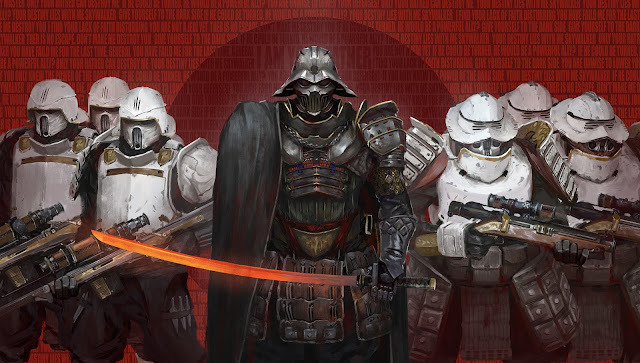 It's pretty great that the artists' made an homage to the samurai culture, and honestly, they've never looked better. A nice touch and a special mention as well would be the number of Darth Vader's quotes in the background. At first, I thought it was a brick wall, until I realized that it's more than what they seem. To be honest, we felt that Tangled! was a bit better than Frozen. I mean, it has catchier songs, a much more heartwarming story, and astounding performances from Zachary Levi and Mandy Moore. Okay, yeah it had a little straightforward story. Regardless, we enjoyed this awesome and cute tribute to the fairly great movie that has an overdue sequel, just like The Incredibles (Seriously, Brad Bird. How long do you expect us to keep waiting?). Personally, I kinda dig the usual painting technique. It's much easier, much more visually inclined, and if you're an expert, much better effects could be seen when you let the excess watercolor drip to form a shadow-like structure. Like I said, even if the technique may be simpler compared to the other methods applied nowadays, none can compare the beauty of handcrafted material. And now is the time for our videos segment. 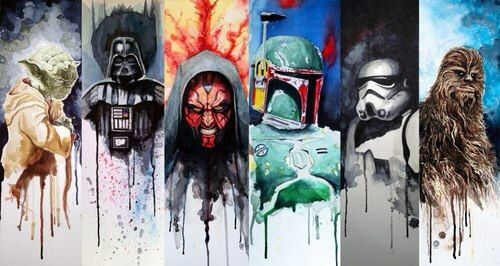 From fan-made films which are just trying really hard to pay tribute to Star Wars, to simple parodies that are entertaining enough just to give you a trip down nostalgia driveway, Star Wars has more than just inspire a few of the most imaginative heads out there, but also touched so many hearts through their love for the series. Do you enjoy Daft Punk's music? Well you better keep looking, because none of their scores are featured here. However, this eye-candy filled extravaganza of a love letter to the long-lived film universe offers a lot of intriguing direction just to reinvigorate your burning passion for Star Wars! Plenty of homages, and a handful of references (If you listen carefully, you can hear a lot of the sound effects used in the films here. ), despite the "okay" songs used for the video. Watch it now! Fan films are often found all over the Internet, but excellent fan films such as Sith Tradition above is very hard to come by. The plot is simple enough, as it follows a Sith Padowan turning against his master and mentor into order to become even more powerful. Story aside, the choreography and special effects is the best thing I've seen in an amateur video yet. What's that? You need a quick recap of the original Star Wars trilogy but you're getting tired of reading the summaries or re-watching the same movies over and over again? Well then, this 8-Bit gem made by Cinefix will get you up to speed on what has happened before you binge watch the sequel trilogy. It's nostalgic, it's whimsical, and above all it's magnificent. Finally for our last item in the entire post, before we give our parting shots, here is Ruins and Reckonings. The story may be confusing, and the computer-generated imagery may seem low-budget (It says fan-made, not officially made. ), the video is definitely worth the view because of its awesome theatricality. Enough said, my young padowans. I believe this is where we end our Star Wars Day special. 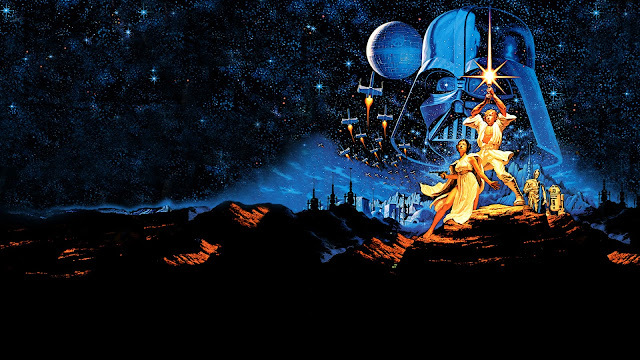 From all of us here at Dateline Movies, may the fourth, I mean force be with you!